Our Mission: As innovative leaders, the professionals at Bell-Anderson are dedicated to protecting and enhancing real estate investments in the communities we serve. Bell-Anderson came into existence in 1963. However, its roots go back even further then that. 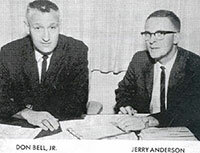 Before Don Bell, Jr., and Gerry Anderson started Bell-Anderson, they each had long-established insurance/real estate firms of their own. In fact Don Bell, Jr., began working for his father's insurance agency in 1946 after leaving the US Navy. Don and Gerry decided to combine their firms on September 1, 1963. Eventually they split the specialties. Gerry took the real estate division oversight and Don oversaw the company's insurance division. It was in the late 60's and early 70's that Bell-Anderson started branching out into property management. One of the hottest trends at that time was the management of condominiums. In 1979, Don Bell was quoted in a local newspaper as saying, "If you can believe history, that's all we're going to have a few years from now." He was right. Today, condos and HOA's are the major development project of the day. From a business prospective, Bell-Anderson made a wise choice in selecting to manage condominiums and homeowners associations. In the mid 1980's Don and Gerry sold their insurance division. With Don semi-retired and an offer from Prudential Benton, Inc. that they couldn't refuse, Don and Gerry closed the doors on their real estate sales division in 1992. At that time, they decided to continue their commercial real estate and property management divisions under the name of Bell-Anderson and Associates. Bell-Anderson and Associates today manages single family homes, small multi family communities, condominiums, homeowners associations, and a few small commercial properties. The company was purchased in September of 2002 by Tim and Vickie Gaskill. Vickie had been an employee of Bell-Anderson since 1986. She was Gerry's general manager for approximately three years before the purchase of the company.